First thing first. Disclaimer: I’m an Apple fan. My phone is iPhone 5. I have iMac and Macbook Pro for my computing needs. I bought the first generation iPad, and is regular user of Apple TV. So I’m very much encapsulate what Steve Jobs have in mind: trapped in Apple Ecosystem. However recently I entered the “dark side” of Android. I bought myself Galaxy Tab Note 8.0 to replace my old yet trusty iPad as my tablet. My first primary reason buying this device is because my stock broker only has their online trading apps in Android. So I have no choice but to try Android tablet. I chose Galaxy Tab Note, as I’m interested with Samsung proprietary stylus, famously named as S-Pen. 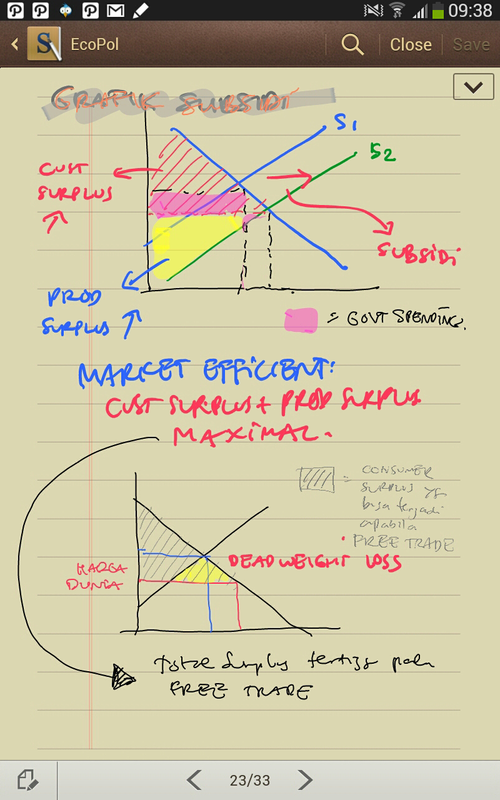 I used my iPad for some note taking, using apps like Penultimate or the excellent Notepad. Also, sometimes when I’m feeling the need to be casual artist, I love to draw or doodle in my tablet. I did it in my iPad, but have used 4 different stylus from a chinese generic one to a branded and expensive Adonit Jot Pro, I’m still not satisfied with iPad for these purposes due to its rubber-thick stylus tip. Hence, when Samsung introduced their hard-thin tip S-Pen stylus, it was on the back of my mind that I got to try this method of input. And after about 4 months of use, I can say this S-Pen stylus and S-Note apps in Samsung Galaxy Tab is the real deal. I still find iPad still excels in overall simplicity and ease of use if you use your tablet mostly for browsing, multimedia player, reading device or games. But for note taking use, Samsung has offered to the market a feature that is currently unmatched by any other device. S-Pen and S-Note: Real Deal. 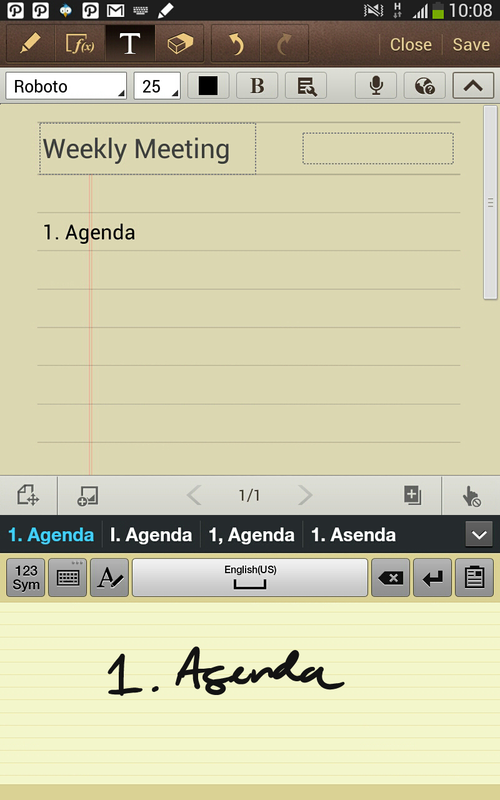 In Galaxy Note Tab 8.0 the S-Pen is located on bottom right corner of the tablet. When you pull the stylus from its nestling place, you’ll find a lightweight stylus with hard tip (yes!) and a small button in the stylus for performing a screen capture or any other functions set by the app. It’s bit too flimsy and light in my opinion, a bit addition of weight would be ideal. But I take it as it is now. 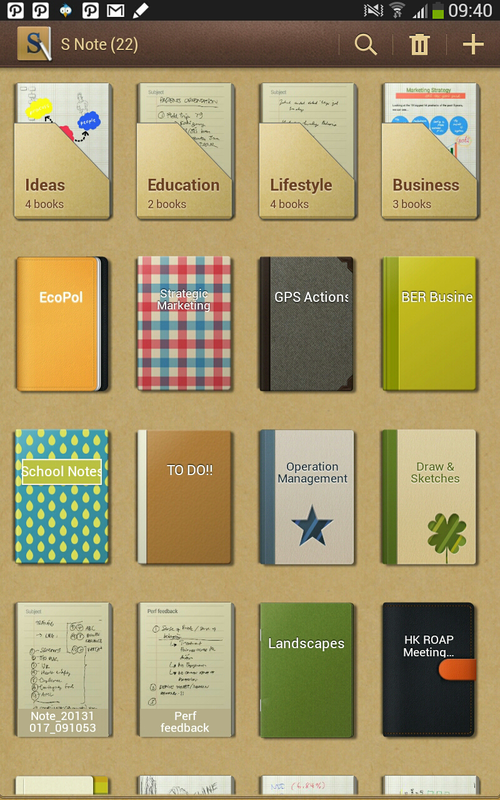 I use the S-Note note taking app mostly for my study purpose. And I find it very useful, enabling me to jot the notes in the class, almost as effective as using the traditional pen and paper. The key here is to buy the screen protector which enable you to move your stylus smoothly on the screen. Some screen protector has a bit “tacky” surface, please move away from this kind of protector. S-Pen in S-Note is very sensitive. I find it almost no lag when we write or draw on top of tablet surface, thanks to its technology and fast processor inside the Tab. It even recognises different pressure you apply on your strokes. So the harder you apply your stroke, the bolder the lines appear on the screen. Just like a real thing. 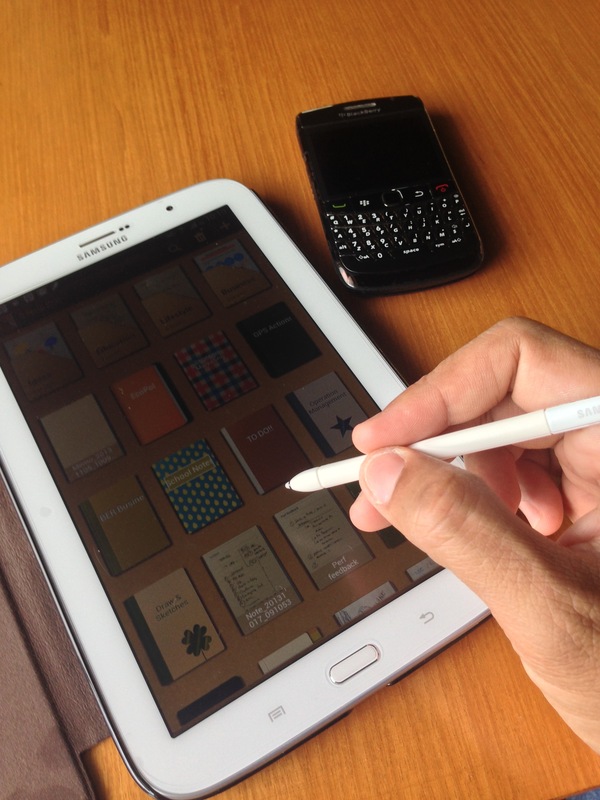 It makes S-Pen and S-Note is not only ideal for writing, but it is also very usable in sketching. 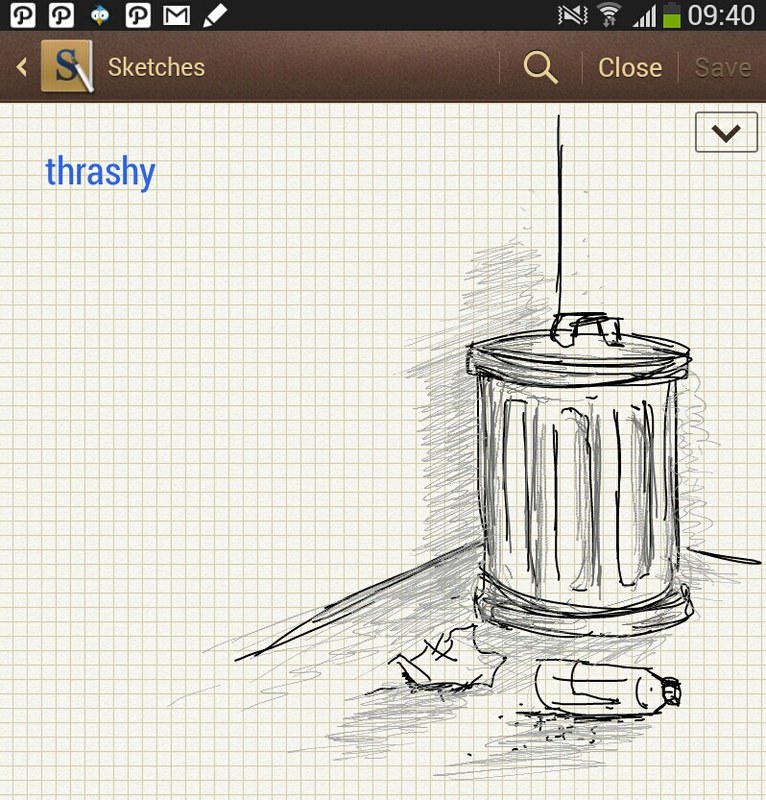 I drew below sketch of trash can using pen and pencil marker in S-Pen, and love the pencil effect when I applied different pressure of strokes in my sketch. Oh, one more: S-Note and S-Pen also has technology to nullify your wrist action. By a touch of a button at low right bottom corner, your tablet will only recognize your S-Pen tip movement. Gone is the time when I had to lift my wrist just to avoid it made a mark on my digital note , a situation I frequently found when I wrote a note on my iPad. A killer feature in my opinion. S-Note allows to store your favorite preset of pen tips. Very useful for people like me, who likes to take note using different colors and pen tips/types to emphasize key points, and to draw some charts in my notes. Here, I stored 6 presets ranging from my black-pen tip (which I use for 60% of my notes), to red/blue/green color marker, and yellow stabillo-esque transparent highlighting marker. 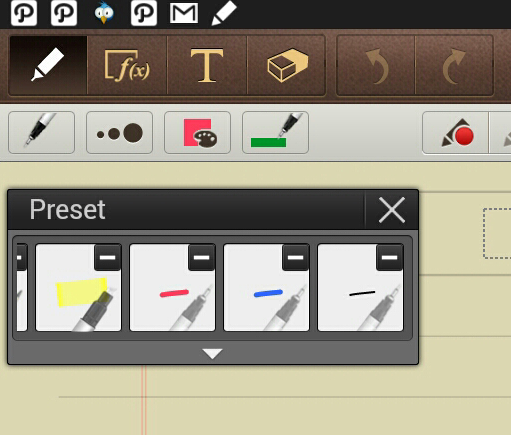 If you have stored these presets on your S-Note, you can easily pick the pen tip you like to use in two clicks. I find it very simple to use, yet fulfilling my needs perfectly. I grew up owning Palm Pilot as my first PDA. I was used to input text in my PDA using Palm’s Graffiti handwriting recognition technology. If your handwriting is not good, or you like to have your note typed up in proper font character all the way, you can opt to use handwriting recognition technology in S-Note. And I found this technology in S-Note is better than ever. Coupled with predictive text input, you can easily write as you normally hand write using your pen, and I found 90% of times, the predictive text input and handwriting recognition guessed it correctly! Well, I personally would rather to keep my notes in my handwriting, but to know that I have excellent option in store is great. This feature also comes handy. 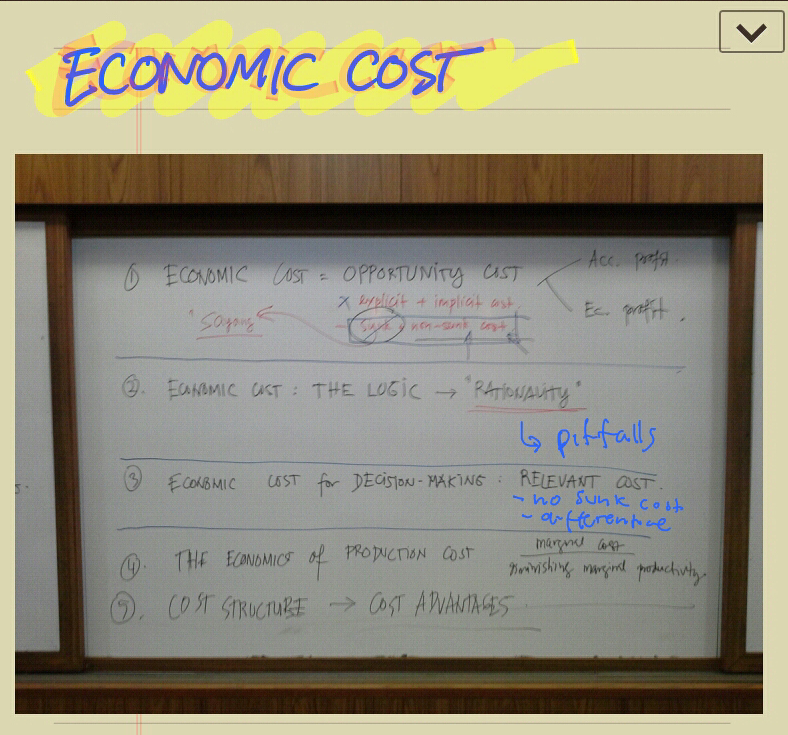 Whenever I’m lazy to write the notes, I can just open the camera on my Samsung Tab, and take pictures of my professors’ scribbles on whiteboard. Voila! It’s now in my notes, and I can add some of my own writing on there as well. Neat. It comes handy to know you just can snap it and paste it! Since you have all the color markers as your pen, why don’t you make your notes more colorful and interesting? That’s what I do. And when you really do want to make your notes less boring, you can always pick from S-Note some of its interesting collection of clip arts! Gone is your boring black and white notepad! So, in summary, if you’re in market for a new tablet which you would like to use it as your productive tool, this Samsung Galaxy Note 8.0 with S-Note and S-Pen will treat you fine. Recommended.